Bathtub Resurfacing – Don’t Replace! • Albuquerque, NM. 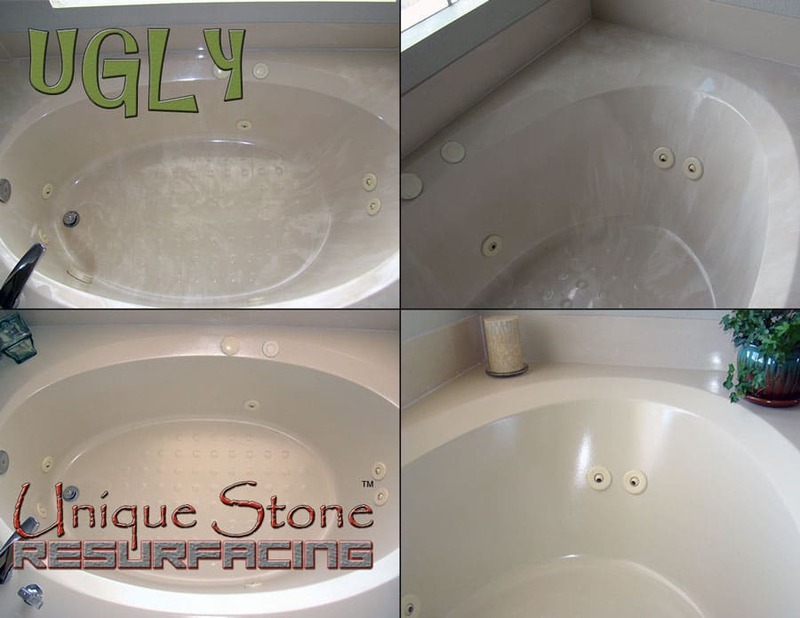 Bathtub reglazing, bathtub resurfacing, and bathtub replacements all have the same goal in common, restoring worn, impossibly dirty, chipped or dated bathtubs to appear and feel like new. A tub can’t “sort of” be reglazed as this can be a procedure that involves the heating of clay, the principal components of porcelain, in a kiln at temperatures as high as 2,500°F. Nor can the bathtub be replaced without spending thousands of dollars. Replacing a tub is complex; a great amount of demolition is necessary. Plumbing and drain fixtures will be removed and the flooring will likely have to be replaced. In many cases the tub is framed in to the wall, requiring demolition of the wall to facilitate removal and if you have a bath/ shower combo the demolition will be even more extensive. Just because your bathtub is chipped, cracked or worn out is no reason to replace it. Even if you have always despised the color; don’t replace, simply resurface. Resurfacing is the process in which worn out or damaged bathtubs, countertops, ceramic tile, fiberglass tubs, showers and sinks can be returned to a new look. The picture above allows for you to see how slick and shiny the final finish is. It feels and looks like white porcelain. Similar to spraying liquid porcelain over your tub or bathtub enclosure. Bathtub resurfacing begins with an extensive cleaning process employing specially formulated cleaners to get rid of soap scum, mineral deposits, and body oils. Then, all chips and cracks are fixed. 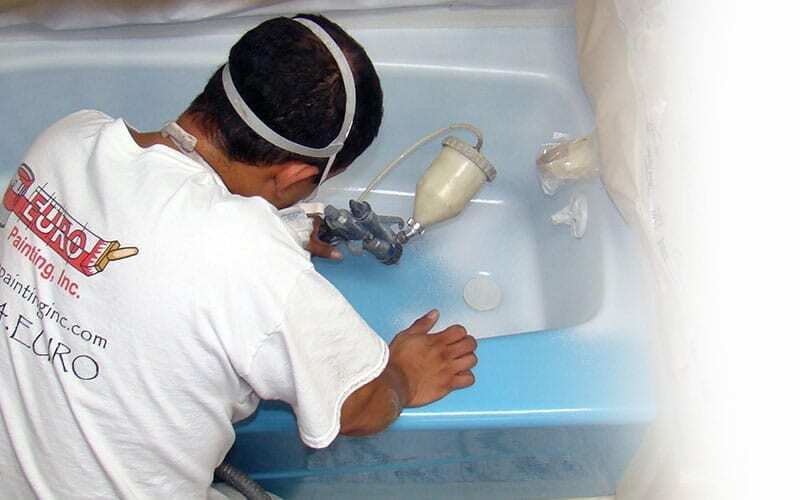 The materials that are used to resurface bathtubs contain proprietary bonding agents which are next applied by a trained technician to create a modern, durable acrylic coating. Tubs are usually finished in shades of white or almond, but Unique Stone Resurfacing™ offers a wide range of options. We have colors to match your surrounding decor or for a truly distinctive look Unique Stone Resurfacing™ offers a line of finishes that appear like natural earth stones that can add a new level of elegance to any bathroom. Regardless, the final product of bathtub resurfacing by Unique Stone Resurfacing™ achieves a flawless finish leaving either the high gloss appearance of original porcelain or a rustic stone matte. The total cost of a tub replacement and removal can be $3,000 or more and bathtub reglazing isn’t a very practical in-home operation. 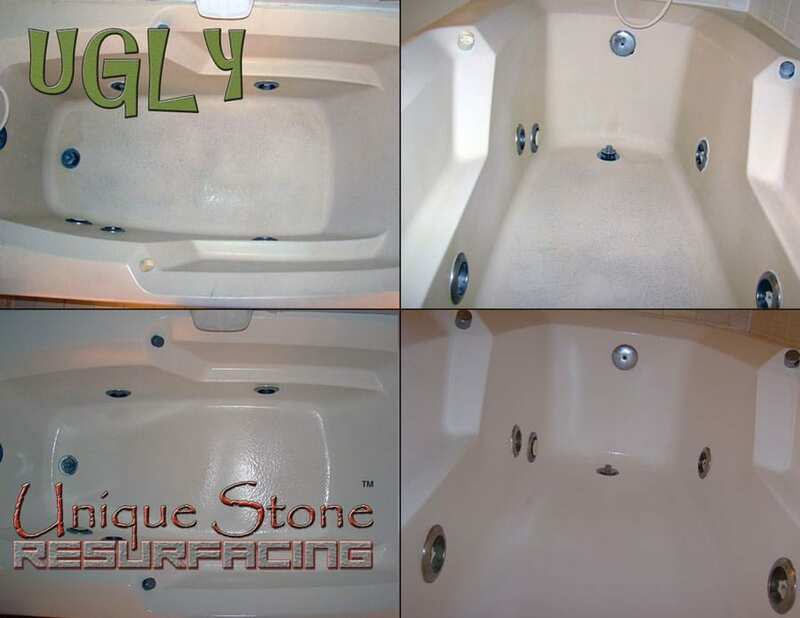 Not only can the Unique Stone Resurfacing™ process save you thousands, but it can extend the life of your tub by over a decade. If you’re considering replacing or reglazing your bathtub, consider contacting our office today for pricing and options for you.